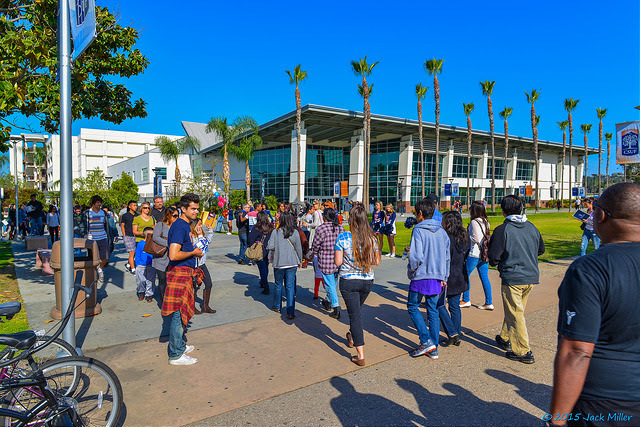 Students at Cal State Fullerton, and all CSU and UC campuses, face possible tuition hikes. Early skirmishes have begun already on tentative proposals to increase tuition at California’s two massive public university systems for the first time in six years. Serious debate and protests – likely to be bruising at points – are expected over the next few months as financial and political impacts are weighed. With the state budget in flux, both the 23-campus California State University (CSU) and the 10-campus University of California (UC) say nothing is set in stone about ending the lengthy tuition freeze for in-state undergraduates. But administrators warn that rising costs of pay hikes and pension plans and such academic initiatives as improving graduation rates may force tuition hikes for fall 2017: as much as $270 or 5% at CSU from what is now $5,472 a year and $300 or about 2.5% at UC from the current $12,294. Political observers predict a series of battles as the proposals proceed through the universities’ governing boards and the Legislature in hearings, votes and closed-door negotiations that are expected to start in January and possibly continue until June. Students and their parents will be watching closely on whether family budgets will wind up more strained and whether financial aid, which a majority of students now receive, will increase enough to ease the pain. Much attention will be focused on whether Gov. Jerry Brown’s 2017-18 budget plan, which will be unveiled in early January and updated in May, will give the universities enough money so they can avoid tuition hikes. But given Brown’s abhorrence of deficits, some education officials are nervous about reports that tax revenues for the general state coffers are slowing down and that various policies that might be implemented by the incoming Trump administration could strain California’s relatively generous social benefits. H.D. Palmer, a spokesman for Brown’s Department of Finance, said it is too early to predict what the governor will propose for higher education funding and how that will be balanced with other needs such as health care and the environment. “At this point, the governor has yet to finish all the decisions he is going to send to the Legislature,” he said. But, according to Palmer, if there are tuition hikes and new funding to the universities, the governor will insist those are linked to improved efficiency at the universities, hastening time to graduation and bolstering course availability. Gov. 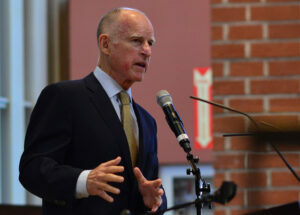 Jerry Brown’s January budget plan will affect tuition proposals. CSU spokeswoman Toni Molle said that the university system’s trustees may discuss a possible tuition raise at their January meeting and then might vote on it at the following session, in March. A $270 per-student increase would produce, she said, about $77.5 million, which would be a major help in filling a $168 million gap between “what we are looking for and what we anticipate the state is going to give.” And even if the trustees approve a tuition increase in March, it could be rescinded or reduced before the summer if the final state budget passed by the Legislature is generous enough, Molle added. A tuition increase “is the last thing we want to do,” she said. Three hundred dollars “can pay someone’s food for a month, or half month’s rent depending on what city you are living in, or it could be all your books for a quarter or your flight home for the holidays,” said UC student leader Ralph Washington, Jr. In a budget deal with UC two years ago, Brown said tuition could stay frozen through this current academic year in exchange for 4 percent annual increases in state funding and UC efforts to improve transfer and graduation rates; that agreement said modest tuition hikes, linked to inflation but no more than 5 percent, could start again in 2017-18. So no one can accuse Brown of springing a surprise if tuition does increase, his supporters say. In response to a recent inquiry from EdSource, UC system spokeswoman Claire Doan said that university officials would decline to comment further at this point because they are still developing budget plans. Student leaders are not being shy about their opposition. In a taste of what may be ahead, UC regents had to take a brief recess at their November meeting after student protesters angry about tuition disrupted proceedings and police cleared the room. Ralph Washington Jr., president of the UC Student Association, said his group wants not only to avoid a tuition increase, but also for current rates to be reduced. And he predicted strong protests across the campuses if the freeze ends. “To some people, $300 may not sound like a lot. But it will be a big difference for a lot of students. It can pay someone’s food for a month, or half month’s rent depending on what city you are living in, or it could be all your books for a quarter or your flight home for the holidays,” Washington said. David Lopez, president of the California State Student Association at the CSU, said his organization is going to lobby the Legislature and governor’s office heavily for funding that would avoid tuition increases. He said students want to focus “the conversation on finding other options” than a tuition increase, which could particularly hurt students who live in high-rent areas such as the San Francisco Bay Area and Los Angeles. The political pressures surrounding the tuition debates were evident in a recent survey by the Public Policy Institute of California. It found that 57 percent of state residents think that affordability of public higher education already is “a big problem” and another 28 percent described it as “something of a problem.” Those opinions seem to reflect not so much the long tuition freeze as the series of big tuition increases during the Great Recession that about doubled CSU and UC rates since 2007. Similarly, professor William G. Tierney, co-director of the Pullias Center for Higher Education at the University of Southern California, said reforms that could save a family money must accompany any tuition increases. He suggested such changes as making more fourth-year high school courses eligible for university credit, creating a much more robust system of online UC and CSU classes, and widely expanding summer schools. All that would allow more students to finish universities in three years, he said. In the shorter run, Tierney said, he did not foresee students abandoning their university education because of a tuition increase. But he said he anticipated that more middle class students will have to increase student loans. Financial aid will probably cover the low-income students and the wealthy will be able to afford the higher tuition. For others who don’t receive much or any grant aid, “I don’t see any way around the debt going up,” he said. Yet another attempt by people who are more interested in their own salary and benefit plans to take money from some of the most vulnerable segments of our society – in this case students (and their parents) who are trying to make a better life through education, and often taking on monumental student loans to fund that. In May 2015 Governor Brown gave the UC system additional tax money (over a billion dollars) in exchange for a two-year tuition freeze. In September 2014 the Regents had already given up to 20% pay raises to “underpaid” chancellors – some of whom were making almost $400K/year. That, of course, will cause greater pension costs. In July 2015 (two months after Brown gave them more money conditioned on it not being used to raise salaries) the Regents voted everyone pay raises, including people making a half-million dollars a year. That of course also increased pension obligations. It was done at a closed-session meeting, of course. In August 2016 the regents once again gave out pay raises to highly paid administrators – in this case another 3%, again for people making upwards of half a million dollars a year. Again, more future pension cost. I don’t know how much of the billion dollars they were given has been sucked up in increases in salaries and benefits, however it seems fairly obvious that any extra money they are given is in part to fund those things – not to fund “better education” for our kids. If you really think that’s what you want to pay higher tuition to support, you should support this. If not? Write Jerry Brown and let him know! Not everyone needs to go to college! This is the problem. We have too many people attending,so they keep having to hire more and more teachers, etc. They are beyond capacity. We let in more foreigners to make up the difference. We let in out of state people to make up the difference. Meanwhile everyone here is shortchanged. Not sure what the solution is- but maybe limiting enrollment, charging more depending on how low or high your gpa is, something.